The Gogora Institute unveils the first book of the "Memoriak" collection: "El siglo de Luis Ortiz Alfau"
The Gogora Institute unveils the first book of the “Memoriak” collection: "El siglo de Luis Ortiz Alfau"
The Institute for Remembrance, Coexistence and Human Rights – Gogora has presented “EL siglo de Luis Ortiz Alfau” [The Century of Luis Ortiz Alfau]. this afternoon. 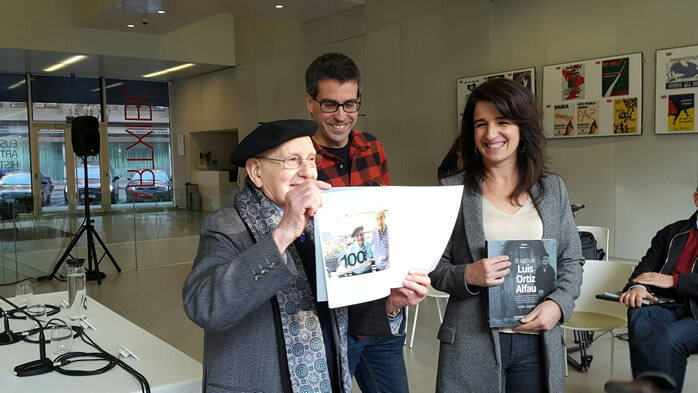 The book tells of the history of the 20th century in the Basque Country through the life of Luis Ortiz Alfau. This biography is the work of Ander Izagirre, the author and journalist, and describes Luis’s experiences in the Civil War, concentration camps, under Franco's dictatorship and his fight to recover the historical memory. This book is the first of the “Memoriak” collection that seeks to put together the jigsaw of the Basque Country’s democratic memory. This content of this book was today presented at the Gogora Institute by the Gogora director, Aintzane Ezenarro, who was accompanied by Ander Izagirre, the author, and Luis Ortiz, the main character of the story. According to Ezenarro, this book is a tool for young people to discover the historical memory of their people. Thus, she stressed that the breach of human rights and way of addressing them are part of the common ground of all the experiences told. The Gogora Institute has thus embarked with this publication on the path to set up the "Memoriak" book collection. It is the first piece of a jigsaw that seeks to gather the stories of what happened in the Basque Country in recent history.